Mine clearance experts conduct operations in the heavily destroyed Old City of Mosul, Iraq . Countless buildings were also booby-trapped, Mr. Lodhammar explained, noting the additional complications caused by having to work in an urban setting with “3D contamination”, rather than a rural location, where mines are usually buried in the ground. 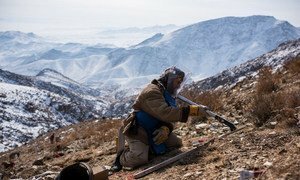 The number of casualties in Afghanistan from landmines and other explosives has more than tripled since 2012, the UN said on Wednesday, in support of a call to provide more long-term support for survivors.